Consider scale. This is especially true when you’re renovating a small bathroom. Some claim that large tiles mean less grout lines which makes the floor feel like one continuous surface. Others opt for lots of small tiles, arguing that a few large tiles make it feel as though you’re cramped on space. The choice is ultimately yours but it’s important to consider each approach before making any decisions. Pick your “must-have” tile first. It might be a simple tile that you can use nearly everywhere, or it might be an expensive option that you’ll end up using more sparingly as an accent tile. 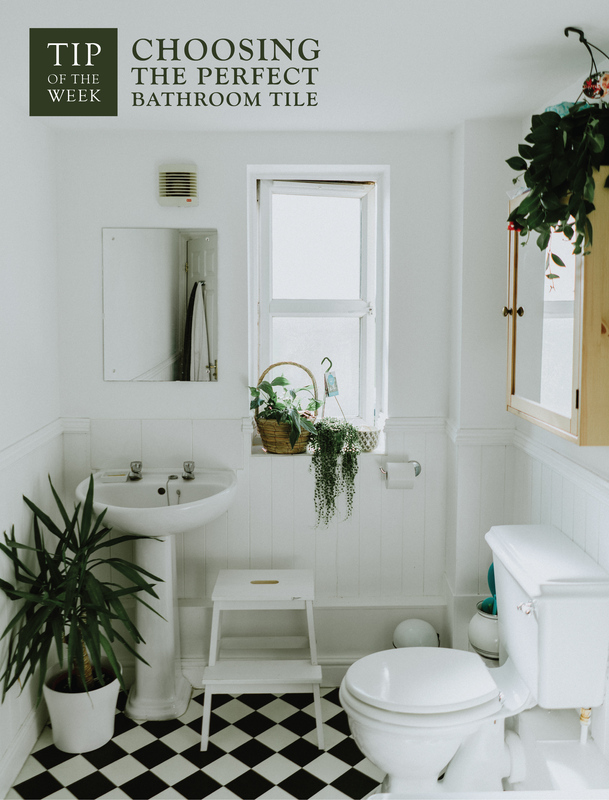 Either way, once you’ve chosen your must-have tile, you’ll be able to build the rest of your bathroom around it. Decide on a color palette. Keep in mind the style of your fixtures & the size of your space. If you’re installing around existing fixtures, choose a tile color that complements the rest of the space. For small bathrooms, consider installing light tile to make the space feel bigger. For large bathrooms, you can get away with darker hues. Try to keep it to no more than three different tile types. You’ll likely want to use more than one tile type to create visual interest. However, too many types, colors and sizes can be overwhelming. If your must-have tile is bold, choose neutral tiles to complement it. This will allow your bathroom to look timeless and will keep elements from competing with one another. Take tile materials into consideration. Porcelain or ceramic tiles come in endless colors and designs and are virtually maintenance free. Tiles made from natural stone offer a more organic look but are more porous, holding dirt and grime and requiring more maintenance. Glass tile gives your bathroom a polished look but it’s very slippery when wet so it shouldn’t be used on a floor. Don’t leave grout as a last minute decision. By keeping tile and grout the same color, you avoid visual breaks which could make the space appear larger. On the other hand, darker grout allows the tile shape to shine. Keep in mind, lighter grout requires more upkeep.